A new rail link between the North East and London has been postponed by several months. Grand Central had planned to operate from Sunderland to Kings Cross from 20 May but an overhaul of second-hand rolling stock is behind schedule. The firm now plans to launch the three-times daily East Coast Mainline service, calling at Teesside and North Yorkshire, in September. Managing director Ian Yeowart blamed the delay on shareholder negotiations. He said: "Our refurbishment programme was held up by negotiations over the change in major shareholder at the start of the year, but is now firmly on track. "We are confident that our trains will provide comfort and reliability to match the best of what is currently available on the East Coast Main Line." Company chairman Giles Fearnley said the delay was disappointing, but that the service would only commence once the entire fleet of six engines and 18 carriages were ready. 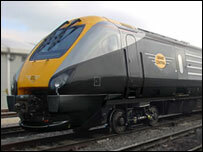 Grand Central is spending £5m refurbishing the 125mph High Speed Trains (HSTs), purchased last year. In November, problems obtaining the stock initially delayed the launch of the service, which was first due to commence on 10 December 2006. The company plans to replace the fleet with 140mph Chinese-built "Polaris" trains in 2010, if its five-year track access contract can be extended. Grand Central is also pursuing plans to run trains between Bradford and London, after an application to launch a service between Newcastle and Manchester was rejected by the Office of Rail Regulation.